In a time when the number of assisted living and memory care communities is rapidly expanding, providing unique services is imperative to stand out in the crowd. The Margaret T. Morris Center in Prescott, Arizona, a residential assisted living community specializing solely in dementia care, has created such a program: Horticultural Therapy (HT). Since its establishment in 2004, the HT program at The Margaret T. Morris Center has become internationally known in the HT arena, drawing visitors and contacts from across the U.S., England, Taiwan, and South Korea. Horticultural Therapist Nancy Snyder works with a resident in the Kieckhefer Strolling Garden. As defined by the American Horticultural Therapy Association, HT is “the engagement of a person in gardening activities, facilitated by a trained therapist to achieve specific therapeutic treatment goals.” In HT, plants serve as the tools to assist individuals in meeting their desired outcomes. Beautiful gardens, indoor plants, and gardening projects are all components that are used. Each individual’s process toward a state of increased well-being in the midst of his or her memory loss journey is the primary focus of a well-designed and implemented HT program. 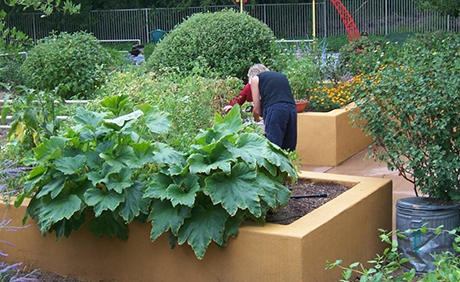 The HT program at The Margaret T. Morris Center was developed and implemented by Registered Horticultural Therapist Pam Catlin. The Margaret T. Morris Center’s parent company, Adult Care Services, began to experiment with an HT program in 1991 under Catlin’s guidance and support from Founder and longtime Executive Director Susan Rheem. The Margaret T. Morris Center initially brought Catlin on as a private contractor. However, upon seeing the benefits of the purposeful and individualized activities for residents, and the creation of a therapeutic HT garden, Pam’s position expanded to full-time within Adult Care Services. The majority of her hours go to serve those living at The Margaret T. Morris Center. Residents involved in the HT program engage in a variety of nature-based activities, including indoor and outdoor planting, plant care, floral arranging, nature art (art or crafts created using natural materials), nature-focused discussions, and cooking. The program offers both group and individual sessions for residents. Group sessions involve 8–12 residents who meet weekly to participate in a variety of plant/nature-related experiences. Individual sessions are offered for those who respond best to one-on-one interaction and involve simple HT activities such as watering, floral arranging, and nature walks. In both types of sessions, residents work towards individualized goals. A minimum of 38 residents engage in HT on a weekly basis at the Margaret T. Morris Center, with approximately half participating in group sessions, and half in one-on-one sessions. Residents grow most of the indoor and outdoor plants used in the program. They have the opportunity to enter flowers, herbs, or vegetables in the local community fair each year, which is a meaningful community integration aspect of the HT program. Pictured at left, resident Barbara Powers holds two blue ribbons she won at the Yavapai County Fair for flowers she grew through the HT program. Herbs and vegetables grown in the garden are used in the HT cooking sessions and by the culinary staff in meal preparation. Cut flowers are used in floral arranging. A large component of the HT program has been the creation of the one-acre Kieckhefer Strolling Garden. Between 2004 and 2005, a wild grassy area was renovated into a park-like setting with wandering paths, raised beds, and a Koi pond. That garden is an excellent habitat to attract birds and butterflies, and was named by the National Wildlife Federation as a Certified Wildlife Habitat. In 2007, the Kieckhefer Strolling Garden was the winner of the American Horticultural Therapy Association’s Therapeutic Garden Design Award. Raised beds and containers for plants. Long water wands and reaching cultivators with adjustable handle lengths. Lightweight hoses, plastic trowels, and hand cultivators. Easy-to-squeeze clippers, loop scissors, and Universal Cuff with a spoon (for those with limited or compromised grip). Nontoxic herbs, flowers, and vegetables. Multiple bird feeders (bird seed gifted by the Prescott Audubon Society). In addition to their use in nature art, culinary activities, and floral design, the plantings throughout the garden are specially selected for their sensory stimulation and reminiscence and to attract butterflies and hummingbirds. A smaller, enclosed garden within the larger acre site promotes safe and independent outdoor time for residents in nice weather. The trees, grass, bushes, and pathways are cared for by a landscape crew, while the planters, pots, and garden beds are planted and cared for in the HT program. Maintaining or improving fine and gross motor skills. Maintaining or improving physical stamina. Maintaining or slowing the level of decline in cognitive skills. Expanding levels of sensory awareness. Maintaining or increasing a sense of spiritual connection. Providing opportunities for intergenerational and other community integration activities. The horticulture program also has benefits for the center, providing increased aesthetics for the site and is a powerful public relations and marketing tool. It serves as a place of peace and renewal not only for the residents and their loved ones, but also for staff and volunteers. The Margaret T. Morris Center has made a commitment to providing a sustainable HT program by incorporating it into the business plan. The company has recognized the importance of having professionally trained HT staff, and is in the process of developing a transition plan for the continuation of the high-quality service into the future when there are inevitable staffing changes. The HT program was cited by CARF in a recent survey report as an exemplary practice. The exemplary stated, in part, “Multiple stakeholders, including residents, family members, staff, funders, and referral sources, highlighted the outdoor space as an incredible asset.” Upon CARF’s recommendation, the residents’ quarterly HT goals are now included in the resident service plans. Catlin and part-time Registered Horticultural Therapist Nancy Snyder work closely with Life Enrichment, Care Partners, and Maintenance staff to provide a rich team-approach for resident services. For more information about horticultural therapy, contact Pam Catlin at pam@adultcareservices.org. The Margaret T. Morris Center participated in the Provider Village showcase during CARF’s 2016 CARF Surveyor Continuing Education Conference in Phoenix, Arizona. The village featured Arizona service providers that received exemplary recognition on a recent survey report. Thank you to The Margaret T. Morris Center for sharing your horticulture therapy program in person with the CARF surveyors.